One in seven couples have trouble conceiving – and it’s often not clear why. But one nutritionist argues that a good diet can affect the health of the sperm and the egg before they even meet. Isabelle Obert, who runs Nurture Me Fertility, believes a diet rich in minerals, vitamins, essential fats and proteins can prepare both a man and a woman’s body for conception. Ms Obert said: ‘I believe passionately that good nutrition is important for ‘good’ fertility. ‘Many of us are leaving it until much later to start trying for a family, by which time our fertility may not be what it was. She goes on to explain how the health of both the sperm and the egg – even before they meet – can affect the outcome of the pregnancy and the health of the baby, child and even through to adulthood. Avocados are nutritional powerhouses packed with minerals, vitamins, essential fats, protein, carbohydrate and fibre. They are a fantastic source of vitamin E, which studies have shown can be beneficial in improving endometrial lining (the lining of the uterus). They can also help with embryo implantation, which is how a fertilised egg becomes a pregnancy. Avocados are also an excellent source of folate. It is known that consuming foods high in folate – as well as taking a folic acid supplement – can help prevent spina bifida. Top Tip: Choose carefully as a ripe avocado is nectar — sliced onto wholemeal or rye toast, topped with cherry tomatoes, basil and a drizzle of peppery extra virgin olive oil makes a nutritious and delicious breakfast. This is one of the most nutritious and healthy vegetables you can eat, with a rich array of vitamins, minerals and antioxidants – as well as significant amounts of digestible fibre. It’s rich in beta-carotene, which is known to help boost production of the hormone progesterone. It can also help increase both sperm quality and count, the latter according to a study published in the medical journal Fertility and Sterility. Top Tip: Butternut squash is hugely versatile -it’s delicious roasted with garlic, thyme and black pepper, or spice it up in a warming curry or soup. A fantastic source of the antioxidant resveratrol, which is thought to help combat against age- related infertility, beetroots are also rich in nitrates. These are well known to improve blood flow and are often used by athletes for this purpose. I particularly recommend beetroot juice for women undergoing IVF treatment as a way to improve blood flow to the uterus to help with embryo implantation. Top Tip: Forget pickled beetroots from school lunch days — try quartering small fresh beetroot, tossing with olive oil, balsamic vinegar and whole garlic cloves. Add some fresh oregano, thyme or marjoram, place in a tinfoil pouch to avoid burning and roast in a hot oven. Salmon is a great protein source, rich in many nutrients but particularly anti-inflammatory omega 3. Research has shown that optimal levels of omega 3 are important in the management of female infertility. 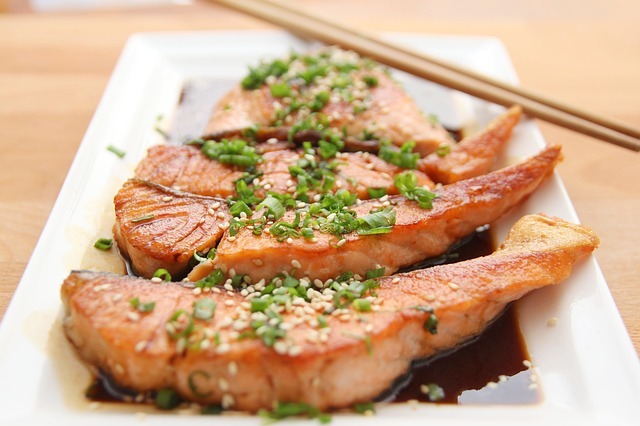 For general health, salmon is excellent for the cardiovascular system, boosting brain function and eye health. Ideally it should be wild or organic in order to avoid unnecessary pesticides, fungicides and excessive omega 6 consumption found in conventionally farmed fish. Top Tip: Salmon works beautifully with oriental flavours – try it grilled with a teriyaki glaze and a crunchy vegetable stir-fry. In ancient Persia, pomegranates were seen as a symbol of fertility and this still exists today in some countries. In fact, research shows that drinking pomegranate juice during pregnancy may prevent brain damage in babies. Pomegranates are also rich in many nutrients, including vitamin C, vitamin K, folic acid and several other vitamins and minerals. And they are known to have anti-ageing properties, anti-cancer properties, can be helpful for cardiovascular health and bone health and have anti-inflammatory properties as well as helping boost blood flow. Top Tip: Incorporate pomegranate seeds with quinoa, walnuts and fresh mint for a Middle Eastern experience. Eggs are among the most nutritious foods you can eat — after all, they contain the nutrients to turn a single cell into a baby chicken. They are rich in choline, which studies have shown can have significant positive effects on foetal development that may have a lasting influence into adult life, according to a study at Cornell University. Eggs are also rich in many different vitamins and minerals, as well as essential fats, and of course are an excellent source of protein. Not only this, they are good value and have a multitude of uses. Top Tip: When time and inclination are in short supply, why not top a wholemeal English muffin with wilted spinach, a poached egg and some black pepper for highly nutritious simple supper. Walnuts are packed with health-giving nutrients which include cancer fighting properties (they’re known to reduce prostate and breast cancer risk). They can be beneficial for sperm quality, are excellent sources of omega 3 fats and vitamin E, which is great for endometrial health, as well as B vitamins and protein. In fact, walnuts could be called ‘king’ among nuts and, according to a study by the Society for the Study of Reproduction at UCLA, a handful of walnuts daily was linked with increased sperm vitality, motility and morphology. This means how healthy and fast sperm are, and whether they are normal-shaped. Top Tip: Eat raw as a simple snack or add flavour and crunch to boost a superfood salad. This little seed is highly nutritious, a complete protein. It’s gluten-free and rich in many minerals and vitamins as well fatty acids and fibre – a great alternative to starchy grains such as couscous and bulgar wheat. A real superfood. The Mediterranean diet is widely recommended for optimal fertility, as it is rich in vegetable proteins, and quinoa makes the perfect addition as it goes without saying protein requirements are raised when trying to conceive and during pregnancy. Top Tip: Quinoa cooks like rice, top with vegetables roasted with plenty of garlic and herbs, drizzle with fruity olive oil and sprinkle with toasted pine nuts for a Mediterranean treat. Watercress is a member of the cruciferous vegetable family and rich in many nutrients including vitamin C, vitamin K, calcium, beta-carotene, iron and iodine — which is often lacking in the Western diets of today. Watercress is well known to be a superfood, rich in age-defying antioxidants that may help to prevent or slow the oxidative stress induced by free radical damage. Several studies have found watercress has significant anti-cancer properties and can help repair DNA damage. Top Tip: What a crime to use just as a garnish — make it the main attraction in soups and salads. Asparagus is high in the potent antioxidant vitamin C and folate (folic acid) amongst other health giving nutrients and a valuable addition to your diet. The importance of folate is well documented in research for both male and female fertility. Top Tip: Lightly steam asparagus and dip into boiled eggs, or grill and sprinkle with balsamic vinegar and shavings of parmesan.